How many tile installation businesses conduct thorough pre-installation inspections? Every tile installation should start with an in-depth pre-installation inspection in order to be successful. Job-site inspections must go beyond the basics of a general walk through. In order to help avoid call backs, use a pre-installation checklist before bidding a job and setting tile. Dedicate staff to a pre-installation inspection, and integrate them into the tile installation process. I've created a handy checklist for your staff to use that's customizable for your business. These are all aspects of a job that are critical to document to help accurately inform the scope of work, and the surface preparation required. It's important to customize a checklist to your business needs. Every business is different, and every job site is unique. Tile jobs should never be bid the same. Download and edit this tile pre-installation checklist to create a checklist specific to your business needs. 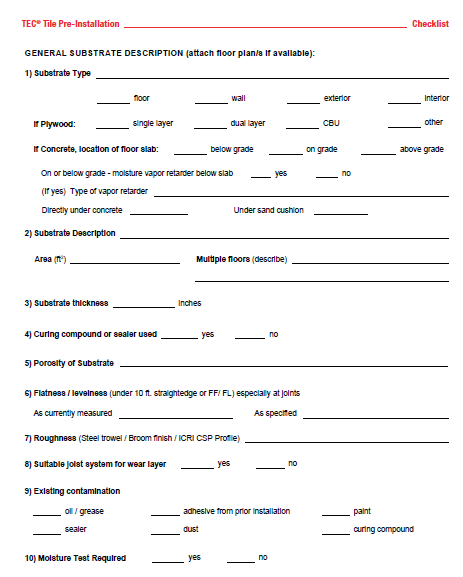 By downloading this pre-installation checklist, you are off to a good start to help avoid call backs. I talk more about this topic in a webinar hosted by NTCA, called "Avoid Call Backs: 4 Secrets to a Successful Tile Installation." You can listen to a recording of the webinar here.